“Millions of people suffer from pain. Pain complaints account for more than 70 million doctor’s office visits per year in the United States alone.” Pain can be the signal of an injury or disease, but not all pain is necessary or beneficial. The author, a graduate of Harvard Medical School, associate professor of anesthesiology at New York Medical College, and associate professor of biomedical engineering at Rutgers University, has been a pain specialist for two decades. She uses this vast experience to give insight into a staggering problem that “must be treated holistically, as both a body and a mind problem.” If those with painful conditions read one book to aid their healing, this is the reference that will clarify all questions. 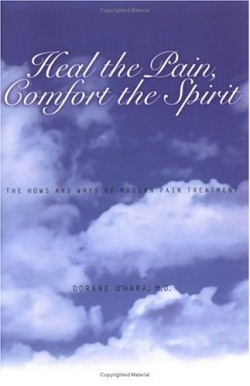 “Today pain specialists, generalists, psychologists, and psychiatrists” recognize that pain exists in the “bodymind,” or in other words, “both ‘mental’—that is, related to thoughts, memories, and fears—and ‘physical’—accompanied by measurable changes in bodily functions.” Pain affects every area of life, causing anxiety and depression; it alters sleep, mobility, appetite, and sexual functioning. Under-treated pain in an acute injury or surgery can lead to poor healing, increased hospital stays, and chronic pain (lasting a few months, especially longer than six months). Chronic pain confuses pain signals and chemical receptors in the body, increasing sensitivity and causing any stress to increase pain. Unhealthy ways of thinking about pain can range from a believing one is being punished to attempting to acquire sympathy and help. These responses can be unlearned. This handy guide explains other beliefs, the biology of pain-in spiritual, emotional, and physical parts-the history of pain treatment, and how different therapies work. Pharmacological, physical, complementary, and alternative medicine treatments for pain are provided in detail, with easy terminology. Case histories and examples of situations are given on various pain problems, such as low back pain and migraine. Results from many studies provide credence. Charts of herbal treatments, common vitamins and supplements with their use, efficacy, and side effects complement the list of pain prescription medications. An exhaustive list of resources for organizations, conferences, and additional information on pain and treatment with addresses, telephone numbers, and web addresses are included. If the patient or clinician puts all this information together and considers pain treatment as a part of overall health care, a positive outcome is likely.